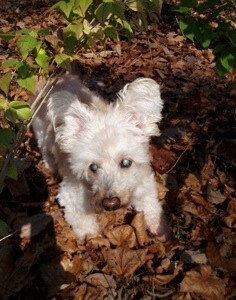 Snuggles is 19 years old and is a mix of Poodle and Pom. My only son just went away to college and I was so lost and alone. Snuggles was only 3 weeks old when his Mommy passed away. I was asked by a friend if I'd take care of him while they were away. I had to bottle feed him and I fell in love instantly. When friend returned home, I begged for him and they gave him to me while they went to a shelter to look for a less maintenance doggy. He became my fur baby. It was instant love for both of us. He didn't take the place of my son but he helped me through the hard times of life. At home, he plays with a blue towel he carries around and shakes from side to side. He goes daily to the dog park to see friends and chase each other and sniff trees to read the mail and see who has been there before. He loves to go for car rides, especially the bank, where they give him treats. He has been our lifesaver when one late night an intruder came in and Snuggles wouldn't stop barking till we got up to check. He stayed right there till the police came. He saved our property and possibly our lives. I consider him our fur baby because he doesn't act like a dog, he acts more human. He's growing old and I will be there for him when it's time for him to pass away gracefully in my arms. Oh my gosh, what a cutie and what a Blessing for you and he! I am amazed he's 19 years old! That tells me a lot about how 'extra' loving and caring you are with him!